I have a love/hate relationship with Facebook. I consider it a huge Time Thief, and yet its the most efficient way for me to stay in touch with my family, most of whom live thousands of miles away. I love seeing the new family pictures, hearing what they're up to, and the times we share funny or endearing memories. What I dislike is that its reduced communication, in the broadest sense of the word, to a single click to show a myriad of emotions, which are left for the eyes of the reader to figure out. Facebook does have a few redeeming qualities that appear unexpectedly from time to time. One of those features happen to be the "On this Day", where it shares photographs and posts from years past, jogging our memories and tugging our heartstrings. At the top of the page is a photograph that Facebook tells me I posted two years ago. 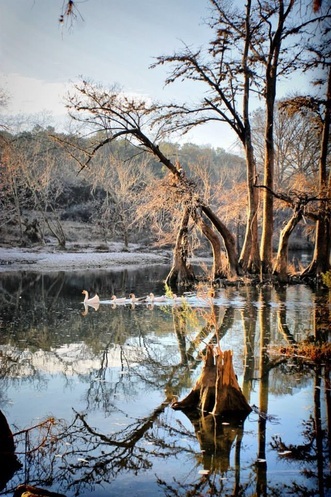 It's of the Blanco River, along River Road, in Wimberley, Texas. We had gone back for a visit, taking our then 8 year old grandson from Canada. A mini vacation for him, in the middle of a large Summer holiday he was spending with us. My son and I had lived in this tiny Hill Country village a few years back, and we found it to be just as the signage tells you on the way into the town - a little piece of heaven. This particular morning in the picture, we'd gotten up early to get breakfast tacos from Mima's, and had taken a little side trip down River Road. It is my favorite place to visit in the village. 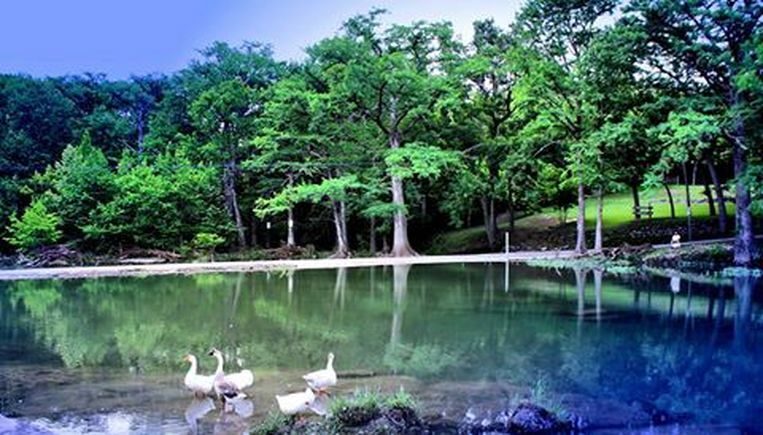 The picturesque road winds along the river, with tall cypress trees lining the shallow shores, while families of ducks and geese glide gracefully in the blue-green water. During the summer months, children and teenagers swing from ropes hanging from the trees along the bank, while still others lazily float in inner tubes in the water, sending quiet ripples across it's glass-like surface. This particular morning most everyone was still sleeping, and it was just us, and a man sitting in a chair on the opposite bank, fishing for his morning fry. I remember marveling at the lush green landscape, recalling only a few months early, on the first morning of the new year, the same spot was covered in a mysterious low lying fog, the cypress trees barren, but stately as the families of geese paid no attention to the cooler temperatures as they glided across the water in their early morning ritual. Sadly, less than a year later, after the serene morning photographs were taken, the picturesque views were gone. In May of 2015 a once in a lifetime flood destroyed much of the panoramas you see in these pictures. They say the water rose over forty feet over night, taking with it large trees, homes and tragically, even lives. We visited a few months after the flood waters had receded, and although the water was still the same beautiful color we remembered, the damage was extensive and emotionally devastating. Silent tears streamed down my face as we made our way down the road we'd traveled so many times before. As tragic as this disaster was, it came with lessons. Two come to mind now when I look at these pictures. First -- we need to embrace every moment of every day for the extraordinary experiences they are. Truly, we will never pass this way again. Life changes, without our permission or blessing. We do not have the gift of knowing what lies ahead and can only appreciate today for what it is - experience it, embrace it, in all its glory, even if its something as simple as hanging your laundry to dry or baking a pie. In a moment it can all change. We only have to look into the eyes of our children as they grow, or our parent's as they age to know that this is true. Secondly, despite the tragedies, the changing landscapes, and the inevitable ebb and flow of life, there is always hope. 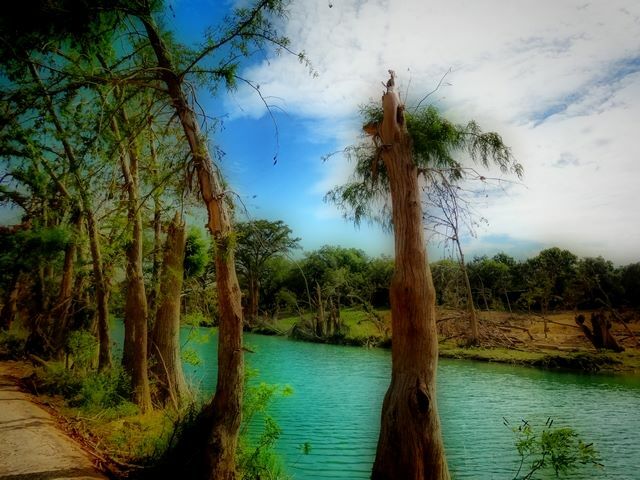 As we turned around that day, and made our way back past the cypress trees bent and broken, we saw movement in the water that caught our eye --- a mother playing with her toddler under the hot Texas sun; splashing while they cooled off in the heat as generations of Texans have for decade after decade. For them, there was still laughter, and the river was still a refuge from the blistering heat, as they appreciated the full joy they were experiencing in its waters at that very moment. I know without a doubt Wimberley will rebuild, the people are strong, I know the color of the water will always take my breath away. 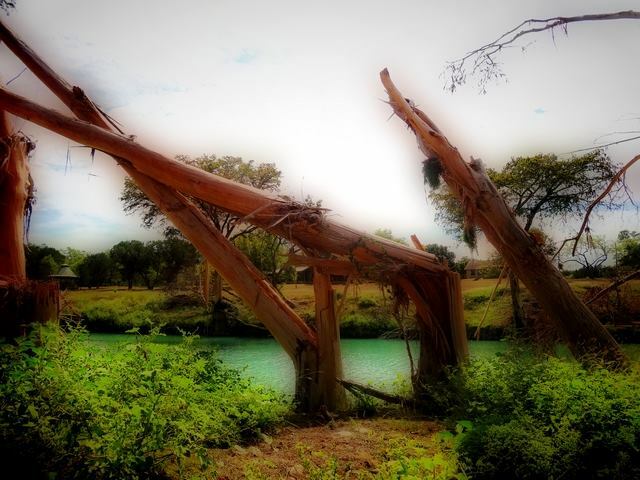 I know that generations from now the traces of tragedy will fade as cypress trees once again stand straight and tall and that this place will always be a little piece of Heaven in the Hill Country of Texas. Thank you Facebook for this reminder.